Now most of the network operator stopped providing free sms in India due to new TRAI (Telecom Regulatory Authority of India) rules. For that many of the users are now depending on online messengers like Whatsapp, Facebook messenger and many other services to communicate with their friends. These online messenger are useful only when both the user have internet connection and both of them using that service. Otherwise those apps are completely useless. That’s why still SMS is popular these days. When you visit windows store and search for sms app, you will see very few sms apps. But most of the app are really not even worth to download. In this post I’m mentioning only apps which actually works and having best user interface. This is my first recommendation for sending sms using windows app. I personally tried this app to send sms and it worked for me. Why I like this app is –simple user interface, it delivers sms, no need to enter username and password every time. To send sms from this app, just enter the mobile number to whom you need to send sms, then enter the message and finally select the Gateway which you need to use and click send button to send message. This app currently supports below gateways to send sms. That means you need have account in any of these website to send sms. When I tested I tried with indyarocks.com account and it worked fine for me. I tested many other apps; but most of them not delivered my sms or not worked at all. So I don’t recommend any other sms apps here. If you wish to try other apps as well, then make sure you read the reviews before trying them. Because some user are complaining that some apps are stealing users passwords so beware of such apps. 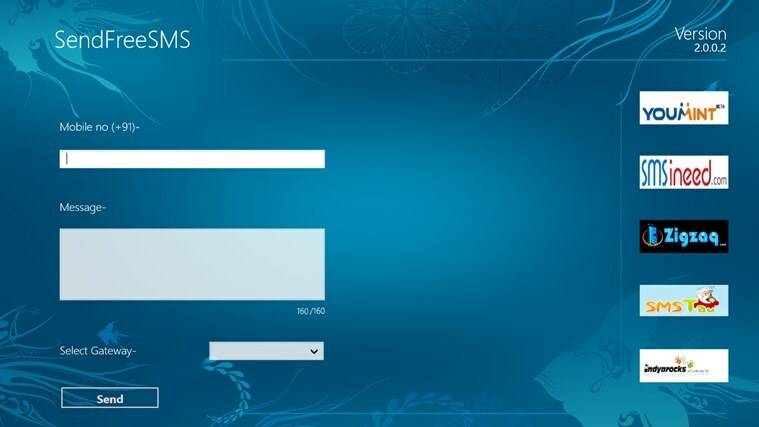 Which app you are using to send sms on windows 8 O.S?